The map below using data from 2013, demonstrates the number of people that commit suicide in a 100,000 sample group. Australia has a similar suicide rate to India, Argentina, Canada, and parts of Europe. In the last 20 years, more Australians have died from suicide than those who have died on Australian roads. It is estimated that someone in Australia dies from suicide every 4 hours. More than 200 people die from suicide each year in Western Australia (WA) alone. 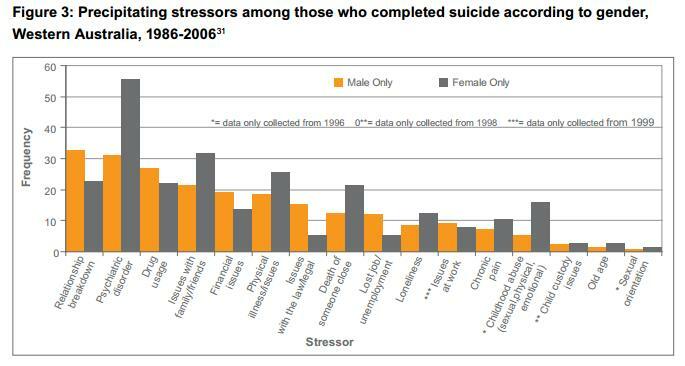 As the chart below demonstrates, there are a multitude of stressors that can contribute to suicide. The highest risks are relationships breakdowns, psychiatric disorders, drug use, issues with family and friends, physical illness, legal issues, and the death of someone close. There is no single cause or solution for suicide, but suicides are often preventable. In 2009, the Department of Health used a 20 year data analysis of suicide activity in WA to establish a suicide prevention strategy. The strategy is aligned with the National Suicide Prevention Strategy: Living is for Everyone (LIFE) and has been a step in the right direction. 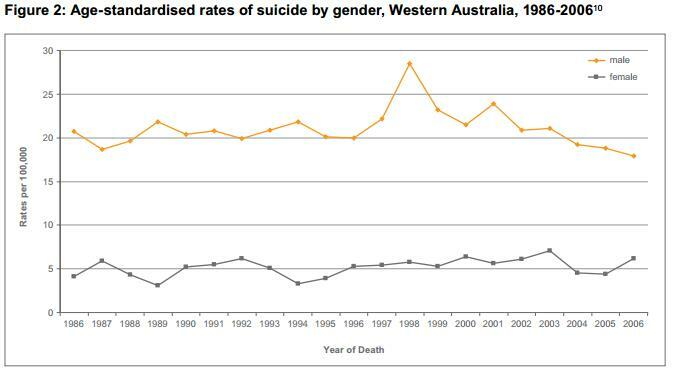 The data showed that suicide rates in WA are high; however, they have been declining since their peak in 1998 of 313 deaths. mental illness requires the government and community to take more responsibility. He also believes that supportive homes, schools, and work environments are essential in tackling mental illness. Incredibly, suicide is now the most common cause of unexpected death among WA teenagers. Of all child death notifications for teenagers received by the Ombudsman since 2009, just under 40% were between the ages of 14 and 15 and almost 75% were from the Perth metropolitan area. Michael Gannon, the vice president of the Australian Medical Association WA, has said that the mental health system in WA is collapsing. The WA ombudsman has embarked on a large scale investigation following the data on WA youth suicide. High suicide rates are often a direct or indirect symptom of greater and more complex problems within the social structure of society. It is important that we work together as governments, communities, families, friends, colleagues, and neighbours to support those around us in fostering healthy environments and happier lives.